When Guild & Company opened in 2012, the steaks were great. But in my review at the time, I voiced my concern that in pragmatic Vermont, a steakhouse focused on local, dry-aged flesh that rang in at $40-plus might not be a sustainable business model. Fast forward two years. Guild & Company is now Guild Tavern. The steaks are still the big-ticket item that draws diners for birthdays and anniversaries, but burgers, salads and other, more casual fare are bringing in diners, too. What lured me back was Sunday's new $10 burger night. The same people (namely, chef-partner Philip Clayton) who brought you Farmhouse Tap & Grill's beloved patties are behind these burgers made from local beef, dry-aged at the Guild Commissary. Put into perspective, given the top-shelf ingredients, $10 is basically a McDonald's price. 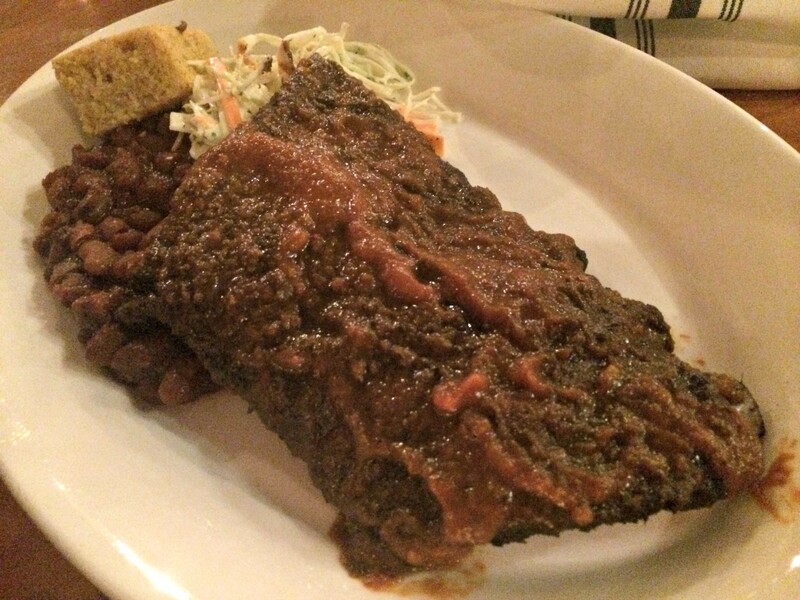 Better yet, the restaurant's summer menu includes five barbecue items. Sunday seemed like the perfect time for a mini reappraisal of a restaurant that has changed much since my last official visit.One thing remained the same: Even when my party of two was one of very few in the restaurant at 8:30 on Sunday night, we were seated, and then given Asian-style spoons filled with an amuse-bouche. It was a modest one — just chopped chard greens paired with pickled stems — but still a welcome touch. The bread basket was optional. Of course, we dug in. The bread was the same focaccia baked at the Commissary and served at Pascolo Ristorante. But in comparison to what I've had there, this batch felt a bit stale. Bummer. 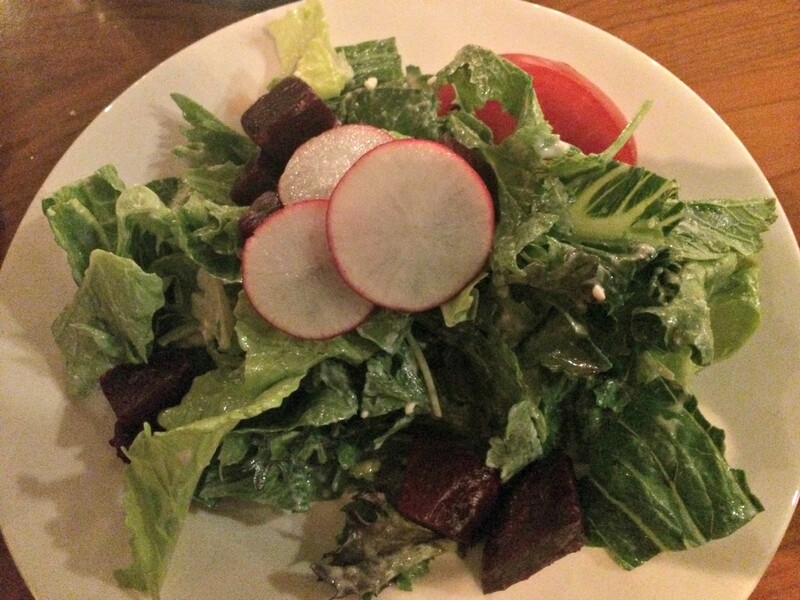 To round out our burgers-and-barbecue meal, we started with a house salad. Fresh local greens and sweet roasted beets (along with a single slice of tomato), were gently cloaked in blue cheese dressing. But I missed the maple-spiced pumpkin seeds that had been omitted. Double bummer. Matters improved drastically when my burger arrived. 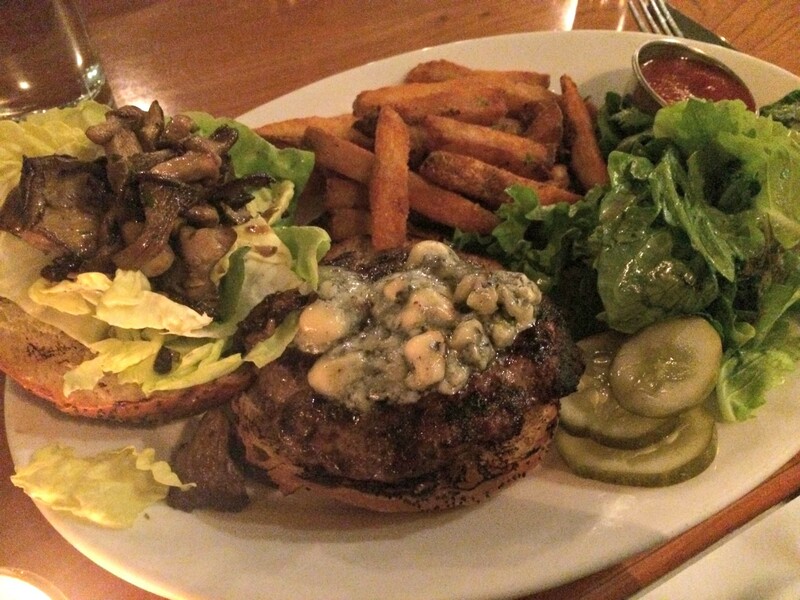 Grass-fed and grain-finished, the LaPlatte River Angus Farm beef is one of my favorites on its own, especially ground into a burger. But once butcher Frank Pace dry ages it for a month, the meat is uncommonly intense in flavor, a beautiful combination of the beef and the earth where it was formed. What better to pair with those serious tastes than some moldy Bayley Hazen Blue cheese? How about lightly grilled oyster mushrooms? I could have eaten a plate of those chewy little fellows. My exceptionally chipper, helpful server, Kate, gave me the option of splitting my choice of fries or greens between the two. This was a great move. The sparkling-fresh greens were dressed in a refreshing sherry vinaigrette, a lovely foil to the lightly seasoned fries with tangy homemade ketchup. A few house pickles on the side were a nice touch, too. I'm picky about my barbecue. Many diners would be thrilled with the smoky ribs I ordered, especially at the relatively low price of $16.95 for a half rack of Vermont Heritage Grazers baby backs. Though the taste was juicy, truly porky and just a bit smoky, the texture of the meat verged on mushy, a matter not helped by a gloppy, tomato-based sauce. The side of pit beans was a bit sweet for my taste, but pleasantly al dente. The crisp coleslaw was a bit overwhelmed by onion, but I still liked that better than the cornbread. As much as I admired the moist texture of the baked good, it tasted like salt, sugar or both had been accidentally omitted. If I were to try the barbecue offerings again, it would likely be a pulled-chicken sandwich, served on the same fluffy bun as the burgers, along with burger sides. But no changes are necessary to that burger. And Sunday burger nights are likely to become a standing date in my house, whether for Blue Cheese, BBQ Beef or the cheddar-topped house burger.